Competitive action got underway in Brazilian football last weekend, just two months after the 2018 season finished. Brazil’s top clubs took to the fields once again last weekend as the 2019 state championships got underway. As I highlighted in a another post a few days ago, the Brazilian football calendar is crazy. There are several reasons for this, but the main one is that clubs and their players have very little time to relax between seasons. The 2018 Serie A finished in the first weekend of December; here were are in mid January and the clubs are already back in competitive action (their pre-season started less than a month after the season finished!). There are 27 states in Brazil and in the state championships, you guessed it, the teams from the same state play each other. This often pits some of the country’s top teams against much weaker opposition from the same state. They precede the national Serie A championship each year. Needless to say, the quality of these state championships is somewhat lower than the national Serie A. And the quality between the state championships vary; for example, the standard in Rio or São Paulo is much higher than in some other states. The state championships last for three months, but occasionally some of the big guns will treat it as a sort of extended, semi-competitive preseason. Sometimes the clubs rotate their squads, while some clubs field purely reserve teams throughout. With a few exceptions last weekend, the big boys fielded relatively strong teams in the opening round of games. 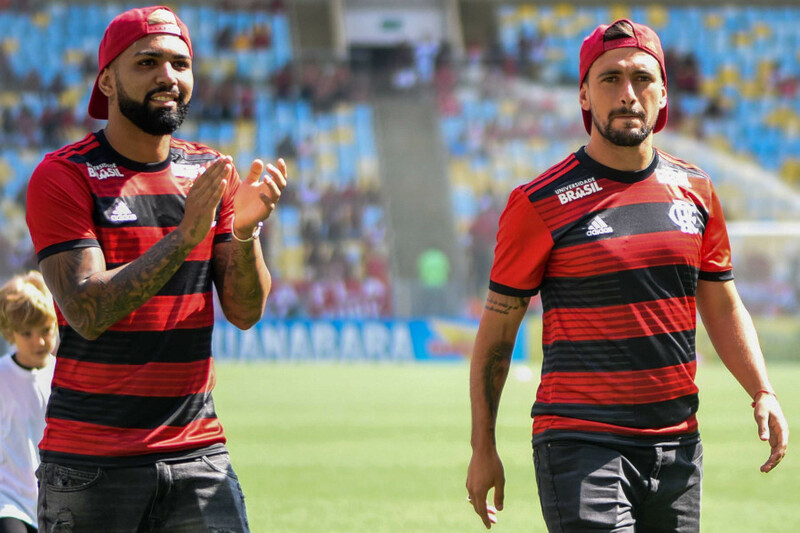 Some of these were new signings, although some of the biggest movers – such as Gabigol Barbosa and Arrascaeta, who signed both for Flamengo – were not ready to play but presented to the home fans. São Paulo (the club) were the big winners in the São Paulo state championship. They beat Mirassol 4 – 1, with their new signing Pablo (one of those big name moves who started the game) getting one of the goals. Corinthians welcomed back their previously successful manager Fabio Carille, who, in what became a quite a saga, left the club for two truckloads of money to work in the Middle East just seven months ago. Corinthians will surely be more competitive this season with him back at the helm and they have made a few good signings too (defensive midfielder Richard, from Fluminense and Grêmio’s box to box midfielder Ramiro – who both started on the weekend – and Argentine striker Mauro Boselli who was in the crowd). Despite this, they could only manage a draw with São Caetano thanks to a last minute goal by their centre back Henrique from a corner. Palmeiras continue to strengthen their already-strong squad, and fielded a strong lineup against RB Brasil. They could only manage a 1-1 draw though. Santos’ new coach Jorge Sampaoli got off to a good start (at least in terms of result) for Santos by recording a 1 – 0 win against Ferroviária. Ferroviária really aren’t the strongest opposition and Santos laboured to the win. You get the feeling that all isn’t well at the club. They have just sold Bruno Henrique to Flamengo, they haven’t made any notable signings and Sampaoli suggested that he was not aware of the club’s terrible financial state before he joined the club. Watch this space for a potentially very short managerial reign. Elsewhere, the big boys produced results that were largely as expected. Cruzeiro and Atlético Mineiro both recorded wins in Minas Gerais with the evergreen Ricardo Oliveira (aged 38) scoring a hat trick for Atlético in their 5 – 0 win. Dedé, who has been subject of much transfer speculation and a bid from big-spending Flamengo, played for Cruzeiro in their 3 – 1 win against Guarani-MG.
Grêmio’s reserves beat Novo Hamburgo 4 – 0, while Internacional struggled to a 1 – 0 against São Luiz in the Gaucho state championship. In Rio, Flamengo beat Bangu 2 – 1 in front of a large crowd, who cheered on the new signings of Gabigol and Arrascaeta before kick off. Flamengo can consider themselves somewhat lucky though. Bangu had a man harshly sent off, which gave Flamengo, and Diego (whose position in the team has been questioned due to disappointing form last year and the arrival of Arrascaeta), the chance to score from the spot. Botafogo lost to Cabofriense, despite fielding a strong lineup, while Vasco struggled to a 1 – 0 win against Madureira. Fluminense could only manage a 1 – 1 draw with Volta Redonda. Those with an eye on up and coming talent, might be interested to know that Vasco will play São Paulo in the final of the Copa São Paulo, Brazil’s premier youth competition. Meanwhile, Brazil’s best young u20 players could only manage a 0 – 0 draw with Colombia in their opening game of the South American u20 championships on Saturday. Apparently Brazil, and Rodrygo, were very poor. They did beat Venezuela 2 – 1 two days later (thanks to two Rodrygo goals) and will play Chile tonight. This entry was posted in State Championships, Weekly wrap and tagged Copa São Paulo, Corinthians, Flamengo, Rodrygo, São Paulo by Brian Davidson. Bookmark the permalink. What is this Red Bull Brasil? Their presence in Campinas appears to have all but destroyed Rio Branco de Americana. Does this mean any major corporation can now buy a club and make a push for Serie A? Rio Branco played in the Paulista first division for 15+ years before being relegated in 2007, the year RBB was founded. Looks like Rio Branco has been relegated several times since while RBB gradually advanced to the first division. Rio Branco had a great development program and produced Flavio Conceicao who would have been playing in Cafu’s place in the 1998 World Cup semifinal absent injury. Agree that the more money the better in Brasilian football but wonder how many Flavio Conceicaos might be lost in the mix if the small clubs fade away. Ze Carlos, who did play in Cafu’s place in the semifinal, played much longer in the Paulista boondocks and even supported himself for a time as a watermelon salesman.